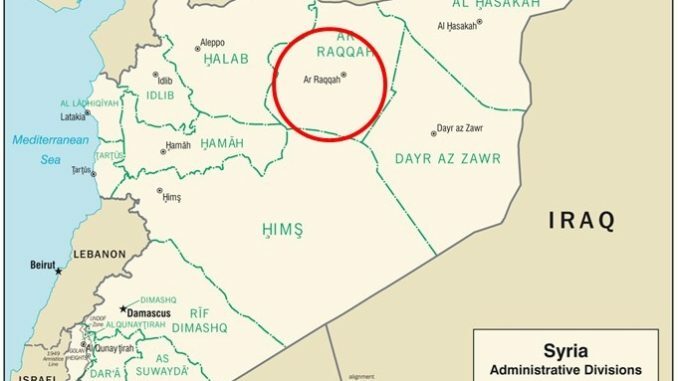 Map depicting location of Raqqa, Syria. (Based on CIA admin map 2007). The Raqqa Internal Security Force (RISF) is a militia organization vetted by local leaders of the Raqqa, Syria community. The Raqqa Internal Security Force will be made up by local fighters that reflect the ethnic makeup of the city of Raqqa and overseen by the Raqqa Civilian Council. 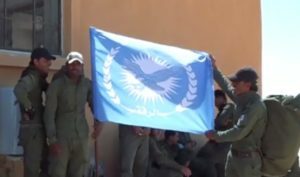 Raqqa Internal Security Force – Syria (Image from Voice of America video). Composition and Training. The Raqqa Internal Security Force will likely be about 3,500 strong and are being trained up by U.S. special operations forces (SOF) along with its Syrian Democratic Force allies. The force will go through a week-long training program on basic military and policing duties and responsibilities. Most likely they will learn the fine art of crowd control, setting up vehicle checkpoints, and how to fire their weapons. Similar to ALP? Some observers have noted the similarity of the RISF with the Afghan Local Police (ALP) program stood up in Afghanistan by U.S. Special Forces. The Afghan Local Police were vetted by local community leaders, trained by U.S. SOF (Special Forces, Navy SEALs, and MARSOC), and outfitted with a uniform and AK-47. The program eventually was turned over to the Afghan Ministry of Interior (MoI) with mixed results. Equipment? According to some news reports the Raqqa Internal Security Force will be outfitted with uniforms, AK-47s, pickup trucks, and medical supplies. They will be outfitted with equipment similar to that provided to the Syrian Democratic Forces (SDF). The RISF fighters will wear a light blue arm patch with the image of an eagle. Mission. The militia force will be used to establish security in Raqqa once the SDF (composed of Arab and Kurd fighters) liberate the city from the Islamic State fighters. One probable purpose of the militia force is to put a ‘local face’ on security forces providing security to Raqqa. Many of its citizens are not happy with the likely liberation of Raqqa by Kurdish forces. “Seven Days, A Gun, and a Prayer: The Pentagon’s Plan to Pacify Raqqa”, Foreign Policy, June 29, 2017. “U.S.-led coalition helps train Raqqa police: Syrian Kurdish officials”, Reuters, March 24, 2017. “US-backed Syrian Forces Step Training Ahead of Raqqa Offensive”, Vocie of America, May 25, 2017. John Friberg is the Editor and Publisher of SOF News. He is a retired Command Chief Warrant Officer (CW5 180A) with 40 years service in the U.S. Army Special Forces with active duty and reserve components.